In time I'll be getting into my blog...getting back into all of my work schedule. My family is still visiting, and I'm savoring the moments with them. In a week, I'll be here alone and back into a normal routine... 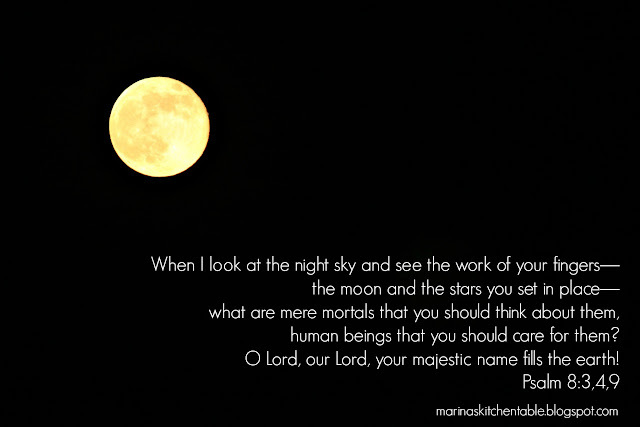 But tonight, I'm watching the moon, holding my grandson, laughing with my sisters.... giving praise to God! I, too, enjoyed the supermoon, pondered it and wrote about it! Glad all went well with the wedding. Enjoy the post-event memories and reminiscing over the highlights!